Rabbi Aaron Rozovsky was ordained in 2018 at Hebrew Union College-Jewish Institute of Religion, the seminary of the Reform movement. Prior to beginning his rabbinical studies, he also completed a Master’s degree in International Studies with a concentration in Latin America at Central Connecticut State University, and a Bachelor’s degree in History with a Spanish minor at Providence College in Rhode Island. The experience he brings to the position is relevant and extensive. As a student rabbi, he served in an array of positions, primarily in small communities: teaching at Kulanu Cincinnati Reform Jewish High School, working at the Center for Holocaust and Humanity Education, advising students at the Hillel at Miami University of Ohio, and holding student pulpits at United Hebrew Congregation in Terra Haute, IN, and Temple B’nai Israel of Petoskey, MI. Rozovsky also has a special commitment to this nation’s armed forces. He has served as a military chaplain in multiple settings, and as a fellow at the Jewish War Veterans of America (JWV) Cincinnati-Dayton chapter​, Cincinnati, OH; and he has worked for twelve years with the Rhode Island Army National Guard​. He also spent a year as a Liaison Officer for the US Army-Israel Defense Forces, in Jerusalem. Born and raised in Sarasota, Florida, Rabbi Dreffin first put down Southern roots at URJ Camp Coleman in North Georgia. At Tulane University, he played ultimate disc while earning a BFA in Hot Glass Sculpture. After a couple of years managing a New Orleans art studio, Rabbi Dreffin pursued his spiritual passions at the Hebrew Union College – Jewish Institute of Religion in Los Angeles. While working towards Masters Degrees in Education and Hebrew Letters, he served as the Religious School Associate Director for Temple Judea in Tarzana, as well as a summer chaplain at Princeton Baptist Medical Center in Birmingham. 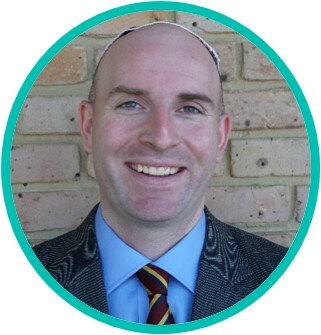 Ordained in 2013, Rabbi Dreffin works primarily with the ISJL’s Education Department while assisting the Rabbinical Department. When not on the road for the ISJL, he can be found working on his house, exploring various culinary delights, and spending time with family.